This spring at the Bullock Museum, experience Purchased Lives: The American Slave Trade from 1808 to 1865 (02/11/17 – 07/09/17). This exhibit will take a look inside the lives of those individuals affected by the domestic slave trade in America with artifacts, first-person accounts, ads and more. Also, debuting at the Bullock and appropriate for Austin’s live music scene, check out the exhibition Common Ground: The Music Festival Experience (03/10/17 – 07/23/17). Curated by the Rock and Roll Hall of Fame and Museum, you will be greeted at this exhibition with a video montage of the top 10 music festival performances of all-time. Finally, this spring experience a home town hero with Pride & Joy: The Texas Blues of Stevie Ray Vaughan (03/10/17 – 07/23/17). This exhibit highlights the life and career of the iconic Austin blues musician and you will find Vaughan’s famed “Number One” guitar, stage outfits, handwritten lyrics and more on display. Visit the LBJ Library between April 8 and September 6 to experience Deep In the Vaults of Texas. This collective exhibit will feature artifacts from ten museums and archives at the University of Texas at Austin. Visitors will have a chance to see some of the most unique artifacts from throughout American and Texas history. Items include Dallas Cowboys coach and former UT football player Tom Landry&apos;s iconic hat, a 1933 watercolor map of the University of Texas campus featuring original buildings which remain a foundational part of the campus today, the handwritten personal memoir of Mexican president Antonio López de Santa Anna who served during the Texas Revolution and more. After months of renovation, The Blanton Museum of Art re-opened their upstairs permanent collection of almost 18,000 works to the public on February 12th. This new concept, “You Belong Here: Reimagining the Blanton,” will present a more coherent narrative for the works on view and feature a representation of diverse histories. It will include newly acquired works, galleries and an overall improved experience for the museum goer. Become an online follower of the Blanton to discover what all goes into reimagining a museum and don’t miss the community celebration March 25. Also new this spring, the Blanton presents, Nina Katchadourian: Curiouser (03/12/17 – 06/11/17). Nina Katchadourian is a celebrated Brooklyn-based artist known for her six-channel video installation, Accent Elimination (2005). She will speak about the collection in-person and will sign copies of her first substantial catalogue on Saturday, March 25 at 4:00 p.m. Newly renovated and expanded, The Contemporary Austin - Jones Center recently revealed the Moody Rooftop complete with the phrase “With Liberty and Justice for All” spelled out in seven-foot-tall letters on the exterior of the building. This stunning instillation is titled - Jim Hodges: With Liberty and Justice for All (A Work in Progress). Additionally, the interior of the Jones Center will re-open April 2 to reveal two new installations including, Garth Welser: Paintings, 2008–2017 (04/02/17 – 08/27/17) and Mark Lewis: Galveston (04/02/17 – 08/27/17). Garth Welser: Paintings, 2008–2017 presents the first monographic museum survey of the paintings of Garth Welser, highlighting key moments and abstract painting. 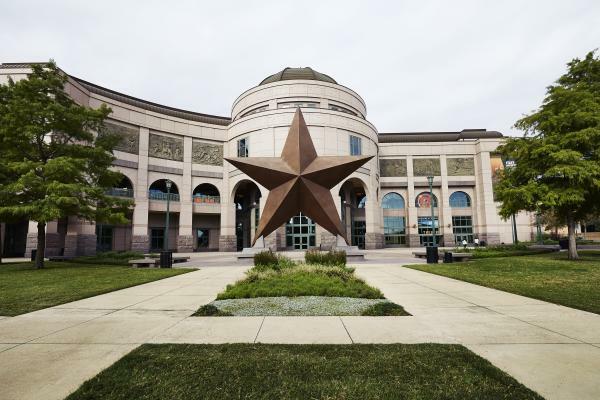 The Harry Ransom Center at the University of Texas re-opened their gallery in February to present Stories to Tell: Selections from the Harry Ransom Center (02/06/17 – 07/16/17). This exhibition includes works selected from the museum&apos;s extensive cultural collections, with more than 250 items on display from manuscripts to photographs. Be sure to stop in and check out these temporary exhibitions and if you can’t get enough of Austin’s museum scene, dive into our Austin Museum and Gallery Round-Up for more.